Dual-phase biomaterials are progressively resorbed by osteoclasts and replaced by new vital bone, produced by osteoblasts and similar to autogenous bone grafts. 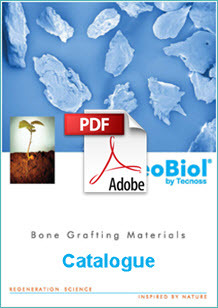 The progressive resorption of OsteoBiol® granules allows an adequate colonization of the grafting site by new vessels, and is therefore a positive and significant factor within the regenerative process. Available in 0.5 and 2.0cc syringes, OsteoBiol® GTO® is Tecnoss’s new ready-to-use pre-hydrated biomaterial that can be easily dispensed into defect sites direct from the syringe. 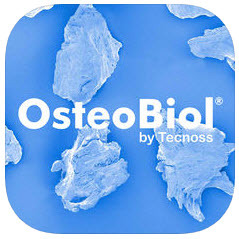 OsteoBiol® GTO® contains Tecnoss’s innovative OsteoBiol® TSV Gel which ensures optimal stickiness of the material, allowing easy adaptability to the recipient site and extreme stability. Buy GTO. Collagen supports Mesenchymal Stem Cell (MSC) differentiation and enhances osteoblast proliferation and is considered as the ideal substrate for bone forming cells. OsteoBiol®dual-phase bone substitutes naturally contain 22% collagen as a consequence of the patented OsteoBiol process. We add extra collagen gel to our syringe packed grafts to improve handling and stability but this introduces higher proportion of Collagen into the graft site. The viscosity of OsteoBiol TSV Gel significantly improves the stability of Gen-Os granules and is particularly beneficial in cases where there is little bony support around the defect e.g. 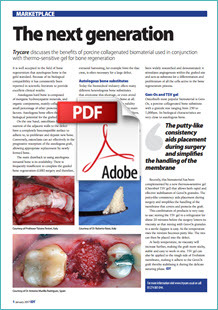 lateral augmentation, sockets with a compromised buccal wall, dehiscences and periodontal one and two wall defects. 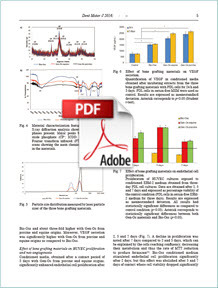 Additionally the viscosity of OsteoBiol TSV Gel improves the fixing and handling of Evolution membranes, particularly during the delicate phase of flap closure. OsteoBiol TSV Gel can also be used as a cicatrizing agent for the treatment of cutaneous and mucosal lesions. The first Guided Bone Regeneration tool for dentistry designed to provide a quick and easy overview of the regenerative needs that a patient may have before placing dental implants. One section is for professionals and the other is to help explain pathologies and treatments to patients. Only available on the App Store for iOS devices - download. The Khoury Shell Technique Video Of Regenerating The Atrophic Crestal Ridge. By kind permission of Dr. Michele Antonio Lopez, based in Rome. The products used include Osteobiol Gen-Os, TSV Gel and Lamina.